Evelyn Lindfors Spiro '49 H'92 A nursing graduate and the namesake of Wagne r's Evelyn L. Spiro School of Nursing, she also helped establish the Wagner–Johns Hopkins–Spiro internship program, which allows Wagner nursing and science students to spend summers at Johns Hopkins for research and clinical education. The generous support of Evelyn and her husband, Don Spiro '49 H'88, has played a central role in the College's advancement. Andy Cortese '72 An accounting major, he is now managing director and head of global investment services operations and technology for AIG. His career path has also included such prominent firms as Spectrum Investment Group, JPMorgan Chase, Goldman Sachs, and Chase Manhattan Bank. 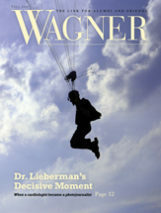 He is a member of the Wagner Board of Trustees and a great supporter of Wagner athletics. Rosa Graziano '98 Inspired by her Italian heritage and her family's Italian delicatessen and catering business in New Jersey, she launched Rosa's Bella Cucina gourmet food truck in Los Angeles nine years ago. Its success is highlighted by high praise from the Food Network and celebrities such as Jimmy Kimmel. Mary Ellen Peters O'Brien '54 Having earned a doctorate in educational leadership, she became a leader in nursing education at Dekalb College in Georgia, where she spent a total of 25 years, included 10 as head of the nursing department. Wanda Schweizer Praisner '54 M'57 won this award in honor of her 29 years as a teacher. She is also an accomplished poet, serving as poet in residence for the New Jersey State Council on the Arts; her third book, Where the Dead Are, is forthcoming from CavanKerry Press. Kinsey Casey '02 , which recognizes young alumni of high achievement. She currently serves as national security director for the White House's Office of Presidential Personnel, and previously she provided advance travel support for Secretary of Homeland Security Janet Napolitano. Rev. Richard Michael, former Wagner chaplain, stepped into spiritual leadership at Wagner after the untimely death of Chaplain Guttu. He has also served congregations in Pennsylvania, West Virginia, and Staten Island, and is committed to Middle East peace and interfaith dialogue. Rita B. King '62 received the Dr. Kevin Sheehy '67 M'70 M'92 H'99. She served six years on the NAA board, including two as president, and also assists with Wagner's career development efforts for students. 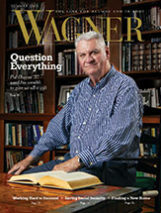 Paul Hansen for his service on the Wagner Planned Giving Advisory Committee. 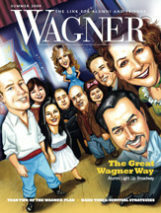 The son of the late Mary Louise Hansen, longtime chair of Wagner's music department, he has helped Wagner alumni make sound financial planning decisions and helped build the Heritage Society, which consists of individuals who have included Wagner in their estate plans. Make a nomination for the 2016 NAA awards!